The Chemehuevi Indian Tribe of the Chemehuevi Reservation is a federally recognized tribe of Chemehuevi people, who are the southernmost branch of Southern Paiute people. To celebrate their organization under the Indian Reorganization Act, tribal recognition, and ratifying their constitution, the tribe hosts Nuwuvi Days, an annual festival held during the first weekend in June. 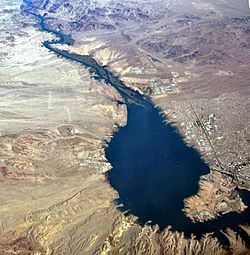 The Chemehuevi Reservation () is located in San Bernardino County, California, bordering Lake Havasu for 25 miles (40 km) and along the Colorado River. The reservation is 30,653 acres (12,405 ha) large and has a population of 345. The tribe owns and operates Havasu Landing Resort and Casino on Lake Havasu, near Needles, California. Chemehuevi Indian Tribe of the Chemehuevi Reservation Facts for Kids. Kiddle Encyclopedia.